Prominent & Leading Manufacturer from Hyderabad, we offer laminated / gelcoat frp pressure sand filters. Laminated/Gelcoat Pressure Sand Filters are used for Residential pools / pools with a capacity not more than 1lac liters. These filters have high strength and withstand the pressure of water with respect to pool capacity. 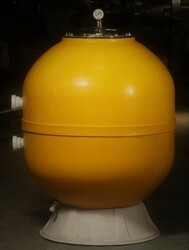 Looking for Swimming Pool Pressure Sand Filters ?